If you want to begin to understand what’s wrong with our current public school system, look no further than teachers’ salary schedules. Public school teachers unions across Illinois have clung to these outdated pay schemes, despite evidencethat shows salary schedules reward teachers for things that have little to do with improving student outcomes. Still, it is important to know how they work. For the foreseeable future – until much-needed reforms are passed – this will be how teachers get paid. Before I proceed, let me explain some of the terminology you need to know. Teacher salary schedules include “steps” and “lanes.” “Steps” refer to how many years a teacher has been teaching, and “lanes” refer to how much education the teacher has. 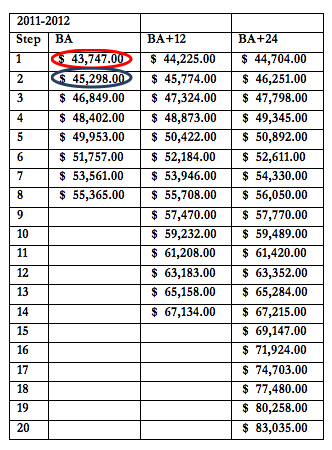 To help you better understand how teachers’ salary schedules work, let’s look how much two hypothetical teachers will make during the 2011 and 2012 school years at Wilmette Public Schools. 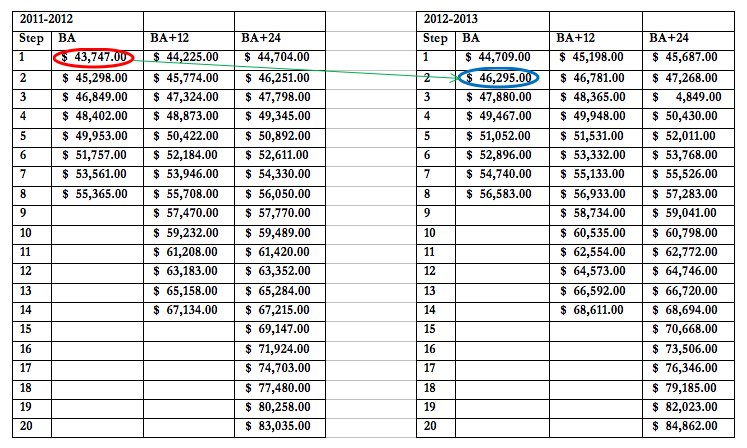 A newly hired teacher in 2011 with a bachelor’s degree occupies Step 1, Lane BA, in the 2011-2012 salary schedule. According to the salary schedule, he earns $43,747 during his first year. Following this pattern, you would think that the newly hired teacher would occupy Step 2, Lane BA, in his second year. This would entitle him to $45,298 in pay – a 3.5 percent increase over the previous year. Not so fast. 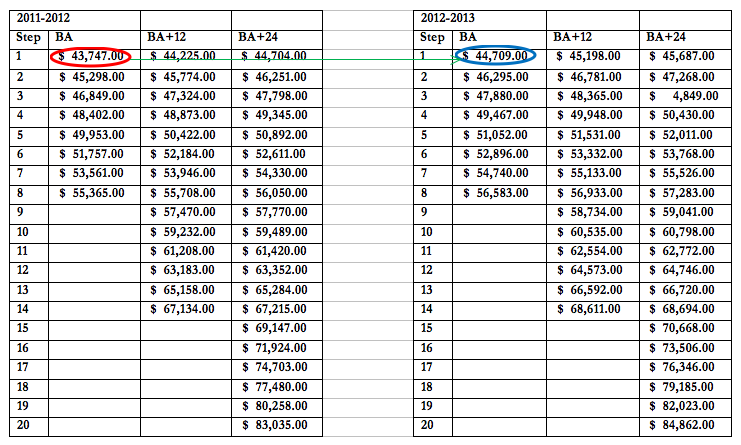 In order to determine how much he makes, we need to look at the 2012-2013 salary schedule. What you’ll notice is that the now second-year teacher occupies Step 2, Lane BA. This means that she will make $46,295 during the 2012-2013 school year – an increase of 5.8 percent over the previous year, not 3.5 percent. Now, let’s look at a different type of teacher. One who is in her fifth year of teaching and on her way to earning a master’s degree. According to the 2011-2012 pay schedule, she occupies Step 5, Lane BA+24 (let’s assume she has already earned 24 credit hours). This means she earned $50,892 during the 2011-2012 school year. Let’s assume she completes her master’s degree during the course of 2011-2012 school year. 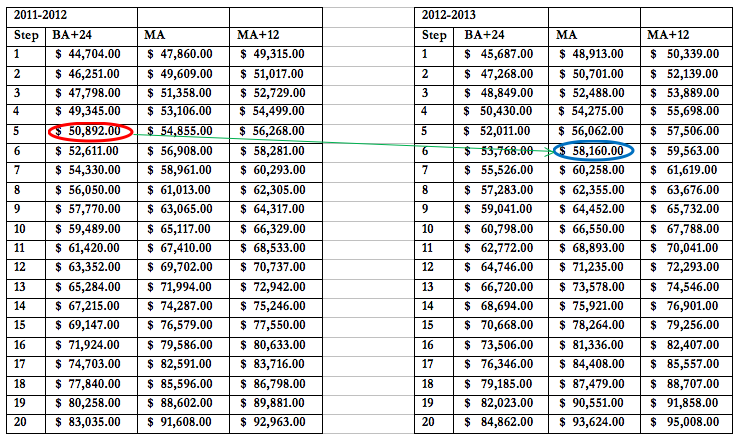 The 2012-2013 salary schedule dictates that she will occupy Step 6, Lane MA, that year. She will then earn $58,160 – an incredible 14.3 percent raise over the previous year. When teachers’ unions talk about salary increases, they don’t account for pay raises in subsequent years. Since no teacher occupies the same step twice – at least not until the teacher reaches the end of their respective lane – it is extremely rare that teachers will see the “small” increase they commonly cite during strike negotiations. To see the complete pay schedule, click on this link. Later this week, I will discuss how teachers’ pay schedules undermine a school’s ability to recruit and retain high-quality teachers and what reforms can be instituted to make sure that schools can hire the right teachers for their students.